And Here Are Some More of Mine:- My Musings – My Reflections. Ekenna intertwines historical, literary, and popular culture references, along with compelling observations, to encourage others to tell their stories too. 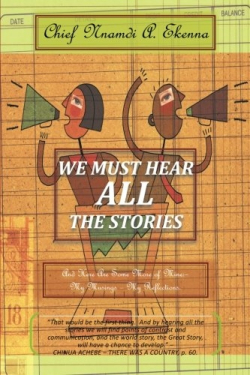 We Must Hear All the Stories, by Chief Nnamdi A. Ekenna, reads as a call to seize the day and share stories in order to connect with the larger narrative of humanity. The book is inspired by the influential African author Chinua Achebe, who said, “My position, therefore, is that we must hear all the stories. … And by hearing all the stories we find points of contact and communication, and the world story, the Great Story, will have a chance to develop.” Ekenna endeavors to encourage others to tell their stories in order to arrive at greater cultural understanding. Ekenna’s call to action, regarding interpersonal interactions and sharing stories, centers on a sincere appreciation for the present, and a rejection of the future as a guarantee. “Waiting may be the death of us,” he writes, and urges his readers to embrace whatever dreams and ambitions they harbor and not wait until the “right” time to pursue them. This is a book built on inspiration and encouragement, written in a warm and conversational tone. The overall format of the book would benefit from restructuring. Ekenna uses many different fonts and space breaks in order to organize and emphasize his points. However, the result is visually overwhelming and cluttered. In addition, the writing would be strengthened by basic line edits for typos and inconsistencies. Though the cover art represents the author’s call, the colors and typeface blur to the point of illegibility. One of Ekenna’s strengths in his pursuit of the “Great Story,” is his ability to intertwine historical, literary, and popular culture references—including Wole Soyinka, Albert Einstein, Bob Marley, Sade, and Bill Cosby—with his own narrative as a means of bolstering his claims. His choice of familiar, if not household, names casts him as a trusted narrator. He is not lofty, though his ideas demand great self-awareness, an almost spiritual astuteness, in his readers. However, his citations might be better given as attributions, rather than footnotes.